It was a HUGE day at Awapuni today for Te Akau with back-to-back victories in the Group 1 Manawatu Sires’ Produce Stakes and a tough win in the Group 2 Awapuni Golod Cup – our fourth Sires and our fourth Gold Cup!! Karaka Million (Restricted Listed, 1200m) winner Avantage (2 f Fastnet Rock – Asavant, by Zabeel) continued her fabulous record with a huge victory in the $225,000 Sires’ Produce Stakes (Gr. 1, 1400m) on Saturday at Awapuni. NZ Champion Two-Year-Old and stable-mate Melody Belle (Commands) had impressively won the corresponding race last year for trainers Stephen Autridge & Jamie Richards, with another Champion Two-Year-Old, Maroofity (Maroof), having won it for Te Akau in 2003 and Kindacross (Cape Cross) in 2005. With a Group One win to back up her Karaka Million victory, Avantage would now be short odds on to emulate Melody Belle as recipient of the Champion Two-Year-Old title. Seemingly with the world at her feet, Avantage was purchased by Te Akau principal David Ellis for $210,000 at the 2017 New Zealand Bloodstock Premier Yearling Sale, from the Oaks’ Stud draft, and the flying filly has won five of her six starts for the Te Akau Avantage Syndicate (Mgr: Karyn Fenton-Ellis MNZM). Notably, her only defeat came at her prior start when she rattled home for second in the fastest last 600m (32.8) on the day to stable-mate Sword of Osman (Savabeel) in the Sistema Stakes (Gr. 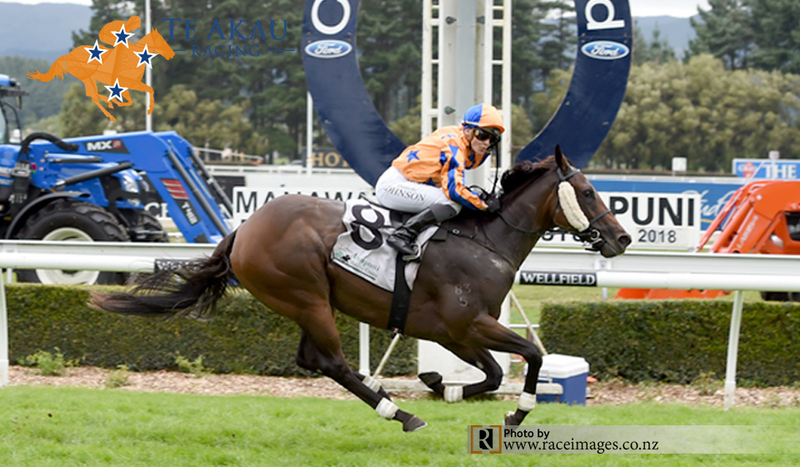 1, 1200m) on 10 March at Ellerslie, having not raced for 42 days since she had won the Karaka Million. Avantage has now banked $766,000 in prize money, but her real value far exceeds that. Across from a wide gate to secure a sweet position (fifth) on a hot pace for rider Danielle Johnson, Avantage was purring along five lengths from the lead at the 600m, travelled clearly the best entering the home straight and she dashed away when the breaks were released at the 200m to win by two lengths. “I had a lot of horse underneath which makes my job a lot easier, and I’ve been able to push the button when she was ready to go.” Johnson said. “She’s given me a feel that I haven’t felt for a long time, so it was very impressive. When I came around the corner I didn’t think anything was going to quicken up and beat her, so it was a huge thrill. Johnson also praised her manager Kevin Booth, for the role he plays in her riding career. On Dead5 footing, Avantage ran the 1400 metres in 1:23.4 and returned $3.80 & $1.60 on the NZ TAB. Prior to the race, co-trainer Jamie Richards suggested it would be very difficult to win from last in a field of 12 on the Awapuni course, that the plan was to be positive and hopefully plenty of early pace would create a gap for Avantage to slot in – which is exactly what happened. “She’s a super filly and she was given a super ride,” Richards said. “Her work had really pleased us through the week and she’d trained on beautifully. By champion Australian sire Fastnet Rock (Danehill), the dam of Avantage, Asavant (Zabeel), won the Warstep Stakes (Listed, 2000m) as a three-year-old at Riccarton, gaining a Group One placing when finishing third in the Darci Brahma International Stakes (2000m). “Karyn and I flew down this morning, and it was great to win a Group One with this Fastnet Rock filly from a family that is really going places,” Ellis said. “It was started by Southlander Willy Calder and he’s done a fantastic job bringing this family to the level it is today, and this filly now has to be worth several million dollars. “It’s the 12th Group One win for Steve (Autridge) and Jamie (Richards). They’ve had four each season and the way they have managed this filly to win first up in October at Riccarton, and still be winning a Group One at the end of March is one of the great training performances. “It was also a beautiful ride by Danielle Johnson. She’s one of the best riders in this part of the world, absolutely on fire. She’s a really disciplined jockey, that looks after her weight and it’s always a great thrill when she rides in the tangerine. Te Akau had three horses in the race: Avantage, Sword of Osman, and Handsome Rebel, strapped respectively by Tegan Newman, Kerry Jones and Teina Walters. “They’re three of our best staff and Tegan has done an absolutely fantastic job in looking after Avantage, who became our 15th black type winner this season and you just don’t get those results without top staff. “I’d also like to make a special mention of Mason Stevens, who looks after the barn where Avantage is stabled. He’s the stable manager, does a terrific job, always tries hard, and in years to come he’s going to be a great asset to our industry. Ellis also said that he and Karyn wanted to dedicate the Group One to the memory of Gloria Autridge, mother of co-trainer Stephen Autridge, who passed away during the week. “She was a very popular person and was great behind the scenes in keeping her husband Bob, and sons Steve and Toby, on the right track, which was a big task at times. They’re a great family and it’s wonderful what they’ve given and achieved within the New Zealand racing industry. And we’re all thinking of Bob this week, at this very sad time. “Avantage is now in line to become our fifth Champion Two-Year-Old, and the year we won the race with Kindacross he had to bow for title honours to another horse we had in the stable: Darci Brahma,” Ellis added.